USGS is working with partners to provide up-to-date information. Photograph from an aerial survey showing the extent and impacts from the landslide in northwest Washington that occurred on March 22, 2014. The survey was conducted by the Washington State Department of Transportation, Washington State Department of Natural Resources, USGS, and King County Sheriff’s Office. A large landslide occurred in northwest Washington at about 10:37 am PDT on Saturday, March 22, 2014. Multiple casualties are confirmed as a direct result of the landslide and many people remain missing. Landslide debris covered about 30 houses and 0.8 miles of State Route 530. The landslide occurred in an area of known landslide activity, but this time the slide was much larger, traveled much further, and had greater destructive force than previously experienced. Precipitation in the area in February and March was 150 to 200% of the long-term average, and likely contributed to landslide initiation. The slide took place along the edge of a plateau about 600 feet high composed of glacial sediments. The volume of the slide is estimated to be about 10 million cubic yards, and it traveled about 0.7 miles from the toe of the slope. This travel distance is about three times longer than expected based on published information regarding previous slides of this height and volume worldwide. If the landslide had behaved in the expected range, it would have likely blocked the river and possibly destroyed a few houses. Instead it led to tragic loss of life and destruction of property. Flow also dammed and temporarily blocked the upper part of the North Fork Stillaguamish River. A pool of water formed behind the debris dam, which flooded houses and other structures. There were initial fears that the debris dam would create a flood hazard downstream if the dam were breached, but a catastrophic dam breach is now considered unlikely. Currently, the lake level is gradually decreasing as the river is cutting a new channel across the top of the debris dam. USGS scientists are supporting state and county agencies responding to the event. It is a collaborative effort, with many working hard to provide assistance, assess the situation, and alleviate impacts. In particular, scientists are assisting with monitoring the stability of the landslide area and monitoring debris-dam erosion and river and lake conditions. USGS preliminary map of the landslide area in northwest Washington that occurred on March 22, 2014. The red line is the approximate upper limit of material that slid during the landslide. Green cross-hatched marks the approximate final location of material that slid. The area in between is where the landslide slid, but left no deposits. The USGS operates a long-term streamgage to measure water levels and river discharge about 12 miles downstream from the landslide, on the North Fork Stillaguamish River at Arlington. The river level at the gage dropped suddenly at about 1:30 pm PDT on Saturday, March 22. The drop in water level was about 1.2 feet, which is equivalent to a drop in discharge of about 1,200 cubic feet per second. Go online and see near-real-time data. Since the landslide occurred, the USGS installed three Rapid Deployment Gages to measure additional water levels and streamflow. These gages are located downstream from the debris dam, in the lake behind the dam, and upstream from the lake. In addition, the USGS installed two buoys to measure lake levels. The newly installed gage downstream from the debris dam also measures water turbidity, and this information is used to monitor the erosion rate of the dam. The USGS is working with multiple federal, state and local agencies to monitor the status of the river and debris dam and help assess what the downstream impact may be on flooding and other variables under different streamflows and debris-dam erosion rates. Seismograph readings show no indication that an earthquake triggered the landslide near Oso, Washington, on March 22, 2014. Seismographic recordings of the landslide event show two impulsive wave signals. The first is interpreted to represent the onset of landslide motion at 17:37 UTC, and a second signal is interpreted to represent a successive slide that occurred at 17:41 UTC. The seismic signals are of long period surface waves, with no clear high-frequency P or S phases that we would expect to see if a local tectonic earthquake occurred at the time of the event. The landslides generated elevated levels of local ground shaking for over an hour. Seismic readings are from the University of Washington Pacific Northwest Seismic Network, operated in cooperation with the USGS. A team of landslide geologists from the county, state, and the USGS are assessing continuing landslide hazard that may pose a threat to search operations. One example is the USGS deployment of three “spiders,” which are portable instrumentation packages that contain high-precision GPS units for detecting landslide movement as well as geophones for detecting small vibrations. The spiders can be emplaced by hovering helicopters. Data from the spider units are transmitted by radio to USGS computers and made available to the monitoring team. Snohomish County is the lead responding agency and is coordinating closely with local agencies. The Washington State Department of Natural Resources, Washington State Emergency Management Division, and Washington State Department of Transportation are the primary state staff at the site to help assess the flood hazard and evaluate how the river may rework the landslide and debris dam in the next few weeks. Many other organizations are playing a supportive role and providing all hands on deck to assist. Other large, and perhaps sudden, landslides have occurred in this valley and in the broader region. Large landslides are the norm in many parts of the western foothills of the North Cascades. The recent landslide in Washington, however, exhibited unusual mobility (i.e., runout distance and probable speed) compared to previously studied events in the area. Examination of high-resolution, remotely sensed topography indicates the presence of similar landslides that may have travelled long distances. This landslide appears to have involved a complex sequence of events. USGS landslide specialists, in collaboration with seismologists and state agencies, are still working to interpret the event. 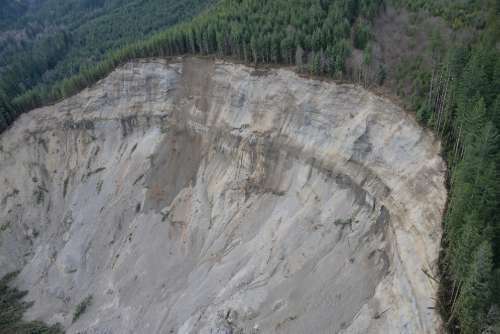 Much of the landslide deposit has character that resembles that of the great Mount St. Helens rockslide, which was a debris avalanche on May 18, 1980, and the largest landslide in recorded history. The distal part of the landslide deposit, in the region roughly south of the alignment of State Route 530, resembles that of a debris flow. Debris flows are liquefied slurries of rock, water and mud that can travel great distances at high speeds, entraining nearly all objects in their paths. Some of the landslide material remaining north of the Stillaguamish River, closest to the top of the landslide, has the character of landslides that scientists classify as rotational slumps.